As much as I want to say this is not my fault, I admit that I really just completely lacked self control. When Carla posted about her Rainbow Rose Quilt Along top, I spied some low volume fabric that I couldn’t resist asking about. And then Carla not only told me what the fabric was… but she sent a link to where I could buy it from Westwood Acres. Those spaceships, aliens, and astronauts HAD to be in my stash. And since I was there… might as well pick up a few more things to round it all out, right? Top to bottom: To the Moon and Back in White, Modern BG Ink Handwriting in White, and Calico Week Day White. Linking up with Sunday Stash to see if anyone else couldn’t resist something that really spoke to them this week! Seriously, if any fabric had your name on it, it had to be that one. The only way they could make it more you would be to print it in blue. 🙂 Of course you needed it! It’s a coloring book for quilts! I had to chuckle when I saw the astronauts . Good for you for giving in to temptation . We all have to do it once in a while. I’m seriously trying to use my stash this year, but my Sunday Stash aquisirions this week we’re not fabrics but Aurifil threads from Craftsy and Fat Quarter Shop. Do threads count rather than fabrics? Yay! So pretty! What a lovely bunch! 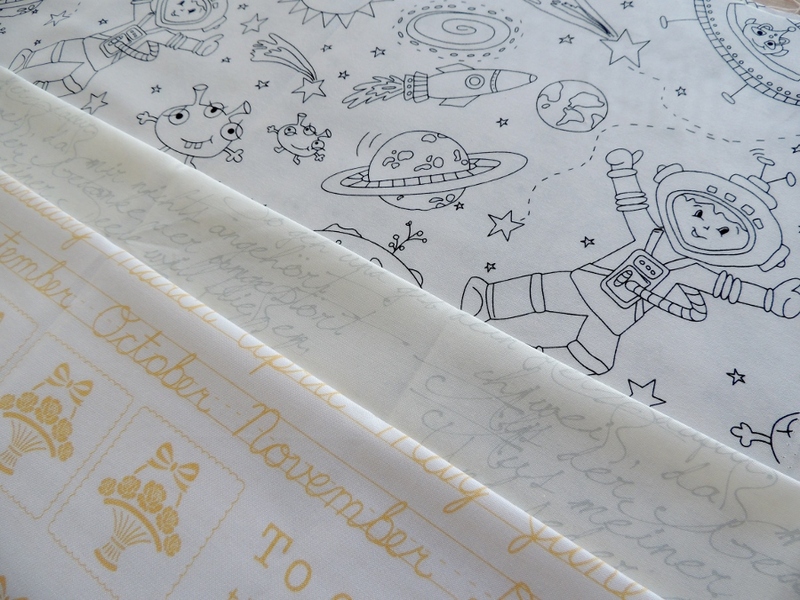 (And I’m so glad you got some of that astronaut print–it’s the best! That fabric is so you and should be in your stash! I’m rather drawn to the middle one…now you make me want to stock my LV stash. Shame on you!! Good Morning Yvonne! I do not blame you for buying these wonderful fabrics. Do you have any plans for them or will you wait until the “right” project comes along? I have not bought any fabrics in awhile, but with all of the fabulous projects I am working on, I can see some restocking is due. Thank you for sharing and have a fantastic creative day! Lovely acquisitions and fun too. I would say most of my stash has been bought on the basis of ‘whilst I was there..’ and the other excuse, ‘need to make it worth the postage’! those are so cute!!! I have the hardest time resisting low volume fabric like those, because they have so many awesome uses. Hahaha. Loved that first line. 😀 I’m sure that print will be very versatile! Great additions to your stash! This was made for you…. And I know you will rock the quilt you make with the fabric. Oooh… I love me some low volume. And those astronauts are super cute! Those look like great fabrics! I’ve been tidying my sewing area and discovering fabrics I already had! (Almost as good). Ha, this post made me grin a wry grin. SO not surprised you bought that fabric! Now, I sure like the middle one…shouldn’t ask…what is it? There I did anyhow! I’ve been actually behaving so well this summer!! Yes, I can totally see why you had to have those LV space creatures! That is brilliant, and will certainly add some fun details to a new project!